Providing an unlimited offering of grass hay is vital to the health of your rabbit. 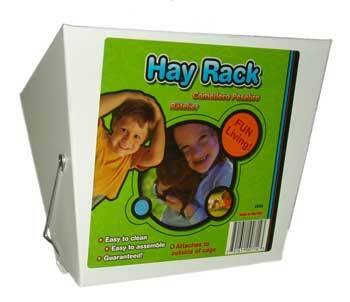 Hay can be a messy subject, but this well designed, durable hay rack helps contain the mess. By attatching to the outside of almost any cage, it provides a visually pleasing and very effective way of providing hay to your rabbit while reducing the mess hay can make! Measures 7.5" x 7.5" x 5" at the top. This goes on the OUTSIDE of the bunny's home and they just pull the hay through the bars of their home.